Meet John and Patty Byrne …. The Fuquay Mineral Spring Inn Bed and Breakfast have quite the love story attached to it. It all started during an 8am speech class at the University of Southern Mississippi. In the class were “Miss Southern Miss” and a Southern Miss basketball player that had a father with a pretty impressive baseball career. Miss Southern Miss was “Patty” was from Gulfport, Mississippi and the tall basketball player was “John” from Wake Forest, NC. Patty recalls how great John was at public speaking. They didn’t know how that talent would serve John well down the road. They began to reminisce about their first date. It was on the tennis courts. This says a lot to Patty’s confidence on the court to entertain a first date with a guy John’s size but Patty had a reputation for being quite the athlete herself. When asked who one, Patty was quick to say “John did BUT we HAD to go into the 3rd set”. They then found themselves on the University calendar. There was a conflict on if they were dating at that time. 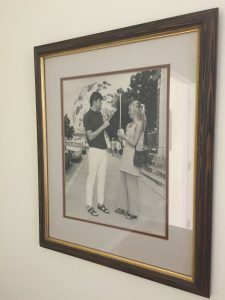 John thought they were but Patty wasn’t quite sure, but regardless the photo that John has in his office shows a couple that in all accounts was the all American couple. The relationship grew and as we all know, John and Patty eventually were married. In 1973 John landed a job at Fidelity Bank in Fuquay-Varina. At the time, Fuqua-Varina did not have a lot of people in the city limits. Everyone pretty much knew everyone so when this new young couple moved into town, people noticed. Dr. William Freeman was the Fuquay-Varina High School Principal and when he learned Patty’s first job was at Brentwood he wanted to talk to her to find out how he could get her to transfer to FVHS. And so she did. John recalls his mother telling him the story of “The Spring” in FV and told him he needed to find it. For those of you new to the area it wasn’t until recently that “The Spring” had an extensive transformation. Until then, one would have a hard time locating it due to the overgrown shrubs. In 1973 John literally could not find it, but he did find Zazzelle Johnson’s house. Zazzelle lived in the home that is now the FV Adminstrative Offices. She grew fond of the Byrne’s and loved it when they would come over to play tennis on her private tennis courts, located on the property. It was that first encounter with The Spring that got John and Patty thinking differently about downtown. Fast forward to 1998. For three years prior to 1998 John spent a lot of time researching Bed and Breakfasts. The hotel industry was part of both John and Patty’s family heritage. Something was calling them to explore turning the Cozart home into a Bed and Breakfast. John had developed an interest in revitalization of downtowns and had started attending the NC Main Street Conferences. In the 1990’s the “sprawl” was happening across the country and all our downtowns were beginning to struggle as people left to head to the strip malls. They thought if they invested it would show people that people are willing to invest in Fuquay-Varina Downtown. He began to shadow and work with Karen Pullens who owns the Pittsboro Rosemary House. He wanted to really understand what it took to run a top notch B & B. The work began in 1998. They added four and a half bathrooms to what is now the three room, two suite Inn. They brought the kitchen up to code so that they could run the Bed and Breakfast and offer cooking classes. They started the work on making this a well appointed facility that now has MANY prestigious ratings and accreditations. 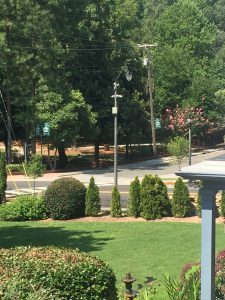 To those who travel the Bed and Breakfast circuits, the Fuquay Mineral Spring Inn is known as one of the top in its class. When asked how they are able to manage running the Inn with John being Mayor and Patty teaching at Campbell University they said they have a great system in place. They both help with the cooking …. Yes, the Mayor of FV cooks! John does a lot of the serving at the table and takes the opportunity to sit with guests and tell them all about the history of Fuquay-Varina. John and Patty talked about people that have come to the Inn and eventually move to Fuquay-Varina because they fell in love with the downtown and the community. 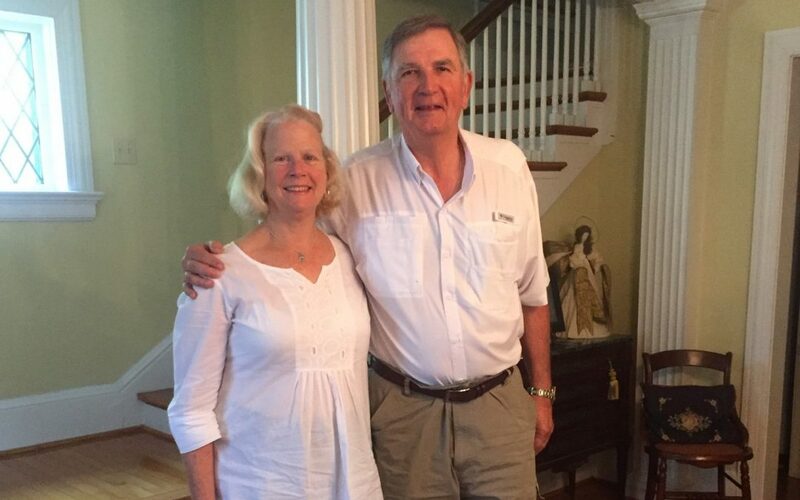 When asked what they love most about owning an Inn in Downtown Fuquay-Varina, John and Patty were both quick to point out how many friends they have made as a result of this business adventure. They talk about friends from other countries that are repeat guests and have learned a lot about other parts of the world as a result of meeting visitors to our area. A 8am speech class in college ended like this. For all those college student out there … word to the wise. Pajamas are not acceptable for attendance. You just never know how that 8am class will have an impact on your life down the road. 1. John and Patty moved into the Inn in 2000, during the 24” snow storm! 2. During another ice storm, there were people from Japan in Wake County and the Inn was one of the few hotels in the area that still had water and heat. The group filled up the Inn. 3. The US Open usually brings a lot of guests since the commute to Pinehurst is not too far. 4. They had a gentleman that traveled from South Carolina each week to take each one of the cooking classes. 5. John teaches a class on how to operate a Bed and Breakfast. He works with 16 to 20 groups each year which assist them in their research. 6. Two years ago they installed a Bocce Ball Court in the back. According to James Richard who rents an apartment at the Ben Wiley …. it is a GREAT court. 8. The Gardens are part of the Backyard Wildlife Habitat Program by the National Wildlife Federation. 9. The Inn is a true “Art Gallery”. Ask Patty to take you around and talk about each artist and what was the significance of the purchase. MANY were purchased from our local Art Gallery, Ashley’s Art who has a reputation of bringing in amazing talent all over the world. 10. 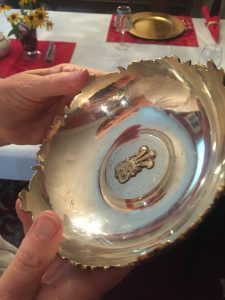 In the china cabinet, Patty has a silver bowl that was a “party favor” of Princess Diana and Prince Charles wedding. John found it during on of their travels and was able to acquire it for Patty. He thought she would like it … he smiles when she talks about it. I would say, he hit a “home run”. Please help support this local business by telling your friends that when they come to visit that The Fuquay Mineral Spring Inn is a GREAT choice! To learn more about The Inn, visit their website. Certainty … There are some things in life you can pretty much count on. One of those things is when you walk into David Anthony’s you will probably see “Eleanor” standing at the gift-wrap area. She’s there to greet you, ask you about your day and of course, get you all taken care of when it comes to the perfect gift! Since 1984 this downtown gem has helped people spread joy with their friends and family. Originally owned by Betty Joyce (Kinton) Sammons, Eleanor purchased the building and business in 1988 and for 28 years has worked six days a week with enthusiasm that might make you wonder if she has a caffeine patch on her arm. Maybe it was her training as a Campbell College Cheerleader (yes, “college” was what they called it when she attended the school) or her genuine love of what she does, but whatever the reason … NOTHING seems to be able to slow down this southern bell. Eleanor’s customers often will tell you they shop at David Anthony’s because “Where else can you walk into a store, find the perfect gift, have it wrapped for FREE and be out the door in 15 minutes.” Yes, folks …. That is even with the “David Anthony’s SIGNATURE bow on top. If you don’t believe them …. go in and try it for yourself! As I was visiting with her a customer walked in. Eleanor quickly said his name, asked about his wife and they both spent time talking about what was happening in their life. It was genuine. It was real. It was “Eleanor”. Eleanor Stephenson genuinely cares about people and about Fuquay-Varina. 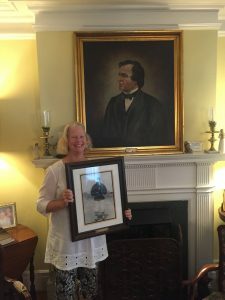 She loved sharing with me how she was born in the house to the left of John Adcock’s office on Academy Street and how she and her very best friend “growing up”, Mollie (Ashworth) Stephenson, would walk to Elliott’s each day after school. She talked about the days when she loved working with brides as they purchased their china and gifts at David Anthony’s. Before the days of Bed Bath and Beyond, Target, etc. she would have around 20 brides during a summer. Talk about an economic stimulus package for a mom and pop! Her eyes lit up as she recalls the MANY teenagers she has hired all through the years as “David Anthony’s” was often times their very first job. Landing a role on the staff is something she has NEVER had to advertise. She smiles and says, “You know, anytime I’ve ever needed a new staff person, they just show up! I know God did that!” She reflects and in her eyes you can see how she loves the memories and how each one made an impact on her life. The big box stores have taken a hit on many small business owners. She said she has many loyal customers and many new to the area seem to really grasp that supporting the mom and pops is so important. She makes certain what she carries you can’t find in the cookie cutter stores of mass production. She has even started offering a “vintage section” in the store where items of real craftsmanship are offered for sale or as she chuckled … a walk down memory lane for people. For a business owner of this length of time you would think they would be tired. But not THIS GIRL. I think she came from “good genes” as I learned her mother was the very first Woman Vice President of a bank in NC. That bank is now what we call “Fidelity Bank”. Eleanor does not stop. She is the first one to jump on an idea and the first one to help a local cause. She sells books for the FV Woman’s Club and FV Museums. Anytime I’ve needed her, her answer is always “Sure”! It is that willingness to help and to be entrenched with what happens in FV is what I believe has kept her going for so many years. As I walked around the store, she loved showing me so many wonderful new things that she was carrying. Jewelry continues to be a big seller for her and her coffee has been a product that has always been a steady staple. Her roaster is from Raleigh so once again … she preaches the “local”. If you are a fan of David Anthony’s FB page you will see items posted daily that will inspire you to head down to see “Eleanor” THAT week. You will walk out happy, not just by the purchase but because you were able to spend some time with “Eleanor”. Greatest GIFT of all!